UPMC holds each employee to five core values. The UPMC values are “Quality & Safety.” “Dignity & Respect,” “Caring & Listening,” “Responsibility & Integrity,” and “Excellence & Innovation.” The service projects this company launches and participates in strive to reflect and promote these values. Furthermore, they try to create a safe environment for the individuals they are caring for, showing respect to everyone surrounding them by listening to their needs and what would benefit them the most. UPMC also takes responsibility for the community, by implementing new, creative, and innovative practices. The Summer Associates Program service committee was created to carry this mission out as much as possible. Being a part of this committee, I experienced just how much brainstorming it takes to come up with projects and advertising strategies for said projects. My team met weekly to catch up on new ideas and think creatively together. We were able to bring these conversations and present the ideas to our co-workers to launch our own service projects by department. The Summer Associates 2015 Service Event was significantly beneficial to my summer internship experience through UPMC. As the service chair for the Supply Chain Management team, I was able to become extremely involved with the service we provided. As a service chair, I was provided with contacts for organizations with which UPMC has relationships , so that I could research these organizations and see what best fit my team’s interests. We decided on volunteering at the Boys and Girls Club of Western Pennsylvania. We spent four hours one afternoon interacting with the children at two different club locations. We were able to give the children the one-on-one interaction that is important for those who need mentorship and older role models. Putting smiles on these children’s faces truly brightened all of our days. Being able to choose a service project for our SCM team this summer was very rewarding. Furthermore, we had another optional service projects for all 106 Summer Associates. 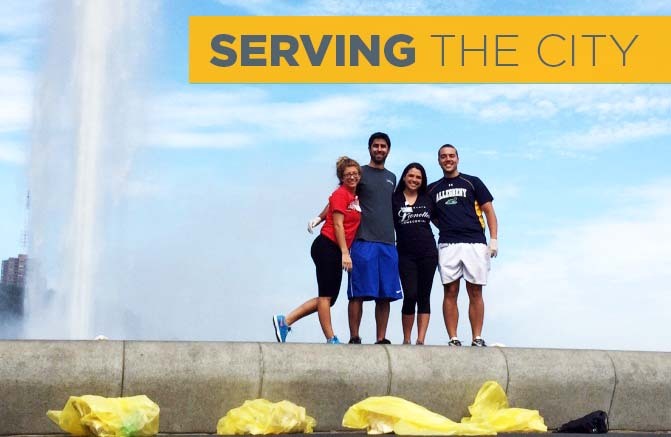 We ventured into downtown Pittsburgh to the Market Square to “clean up” the city. The service project was called “Downtown Blitz”. We were all split up into small groups to perform various service activities such as weeding, graffiti removal, wiping down public fixtures with cleaner, and general litter clean up. Although that doesn’t sound like the way you might choose to spend an afternoon, this project was actually an amazing experience. We were able to show our appreciation for the city that UPMC strives to care for. We were able to show the people of Pittsburgh that we are here for their well-being in ways beyond health care. It was a great way to help while also sight-seeing through the beautiful downtown Pittsburgh area.